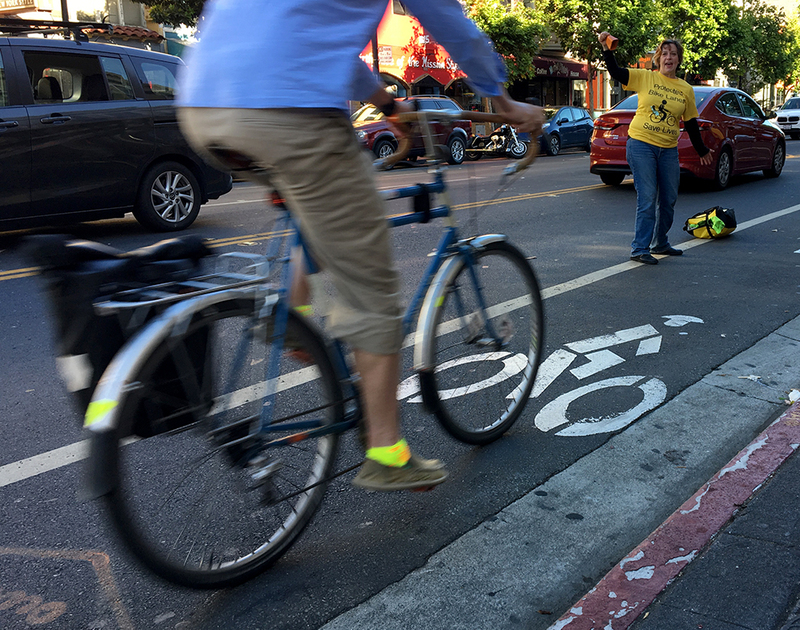 A cyclist rides on Valencia Street as a bike safety activist stands on a painted lane divider to advocate for protected bike lanes. Mayor London Breed is asking the San Francisco Municipal Transit agency to accelerate cyclist safety improvements on Valencia Street: namely, installing protected bike lanes along the corridor between Market and 15th streets within four months — much sooner than the agency had originally planned. “I am tired of waiting for months, and often years, for important Vision Zero projects to be implemented when we know they are urgently needed to protect pedestrians and bicyclists,” Breed said in a statement. The transit agency had, in fact, already begun plans to install protected lanes and make curb improvements this summer. It hosted several workshops in July and August with the San Francisco Bicycle Coalition, in which more than 100 cyclists attended and offered feedback on how those bike lanes would look. They would be piloted along Valencia between Market and 15th streets. But, according to MTA’s timeline, those improvements would not have been complete until late 2019. And that, the agency said, was a “near-term” goal. “The takeaway is that we are trying to make incremental change on Valencia,” said SFMTA Program Manager Miriam Sorell at the meeting in July. “Incremental,” apparently, was too slow to for Breed and bicycle-safety advocates. This four-block stretch of Valencia sees the highest volume of cyclists — and the highest rate of cyclist injuries. The bike lanes would be moved closer to the curb, and parking spaces would separate cyclists from the roadway. The pilot would inform further changes along the popular biking corridor, the mayor’s office said. Breed has also mandated that the transit agency’s so-called “Rapid Response Team” — which is in charge of quick road maintenance — respond within within one hour of a serious injury or fatality of a cyclist and analyze, over a 24-hour period, how improvements can be made to avoid another incident. Those improvements then must be made within 72 hours of an incident. “After a serious crash, the City should respond quickly to identify the problem and make the changes needed to prevent future crashes,” said Cathy DeLuca, Walk San Francisco’s policy and program director. Valencia Street is part of San Francisco’s Vision Zero high-injury network — among the 13 percent of San Francisco’s streets where 75 percent of all serious and fatal traffic-related injuries take place. Jefferson McCarley, a spokesperson for the Valencia Corridor Merchants Association, welcomed the news. He said, recently, cyclist safety has been a major focus for the merchants’ association — and it will be focusing on drafting its own proposals in the coming weeks. McCarley, a cyclist and former general manager at Mission Bicycle, noted that the pilot on the stretch from Market to 15th streets will have few downsides, because businesses are sparser on those blocks. “But between 16th and 24th streets — that’s gonna come at a cost to parking, parklets, carshare pickups and drop-offs, and commercial vehicle delivery,” he said, adding that some merchants might be concerned about losing business. Yet, already, the status quo has begun to change. In March, the MTA installed flex posts along portions of Valencia Street to prevent cars from stopping at “bulb-out” curbs. And, soon after, Lyft began diverting pickups and drop-offs from the corridor between 16th and 19th streets onto side streets. Lyft made the practice permanent late last month. This is good news, of course. I have a question, I’m sure this has been considered already because it is so obvious, but I’d like to know if anyone knows- why do they put the bike lanes on streets that already have heavy car traffic? Especially in the mission, it seems like they could dedicate entire alleys just to bikes; cars could still use the alleys for parking, but as of now there is barely any real traffic in those alleys. Those flexible posts create an even greater hazard. Cars are still pulling into the bicycle lane and stopping where the posts begin. This forces bicycles to go around both the car and the posts instead of being able to return to the bike lane once they’ve passed the car. Even if Lyft is forcing passengers around the corners on Valencia, Uber is not. Bicyclists only hope for safety is if police ticket every driver who pulls into the bike lane to pick up a passenger. I regularly see police car parked in the bike lane on Valencia, less than 2 blocks from their own station. So I’m not holding my breath on them ticketing the drivers.